Passivhaus aficionados like to make the point that Passivhaus construction doesn’t have to cost any more than “normal” construction. This seems counter-intuitive because the Passivhaus standard demands certain rather expensive features, such as triple-glazed windows, mechanical ventilation with heat recovery and more insulation than you can imagine fitted into places you’d never dreamed of. How can that not cost more to build? The argument seems to go like this. You learn to work the Passivhaus way and each project you do gets relatively easier and quicker and less expensive. You also learn to design in ways that make it easier to build a Passivhaus and, bit by bit, you close the gap between “normal” build costs and Passivhaus. Plus there is the added bonus of being able to do without a space heating system or at least a large space heating system, which saves a bit. The argument goes that if all houses were built to Passivhaus standard, within a couple of years the cost premium would vanish. But there is a problem with this argument. The physics of heat loss dictate that, for efficiency’s sake, you need to maximise the heated volume and minimise the area of the envelope enclosing it. The heated volume determines what heat you have to deliver and the envelope surrounding it determines how much of that heat you lose. Getting the form right is one of the key determinants of effective Passivhaus design, yet is something that isn’t made explicit. The most energy efficient shape for a building is a cylinder (it’s why Thermos flasks are shaped that way) but this is impractical to both build and live in. The most sensible conventional shape is a square box, three storeys high. 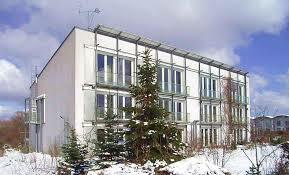 Take a look at the original Darmstadt Passivhaus (pictured) built by Wolfgang Feist. Guess what? It’s essentially a three-storey square box, albeit in a terrace of four — terraces also work well because of the shared party walls. Very efficient form. Changing a square box into a rectangular box has a small detrimental effect which gets more extreme as you add to the length and shorten the width. Reducing the structure to two-storeys also decreases efficiency a little, but neither of these two measures make a substantial difference. But certain shapes get severely penalised by this remorseless geometric logic and none more so than single-storey house or extension. Single-storey-anything blows the ratio out of the water as the envelope needed to encase a single-storey structure is usually 30% larger than it is on a two- or three-storey dwelling of the same floor area and therefore the heat loss will be 30% greater. Just because of the shape. You could still build a Passivhaus bungalow but it would require far more insulation, and it would be much more expensive to construct. Consequently, you don’t see many (any?) single-storey Passivhauses. So when you hear that a Passivhaus costs no more to build than a conventional house, bear this in mind. It may be true, provided you keep the design within certain tight parameters. To put it another way, the Passivhaus standard is either restrictive in what you sensibly can do, or costly to build if you want something that isn’t a plain box-shape. To be fair, this same rule applies to the building costs of shells generally, not just Passivhaus. But because Passivhaus places so much emphasis on constructing a highly-insulated and airtight shell, it exaggerates the difference.